A Prunus domestica L. cultivar. ‘Fruit medium sized, oval, narrowing towards the stalk, flattened on one side, where it is marked with a distinct suture. Skin dark purple, dotted with grey dots and veins of russet, and covered with blue bloom. Stalk an inch long. Flesh firm, juicy, sweet, and brisk, separating from the stone. Shoots smooth. A culinary plum. Ripe in the end of September.’ [Hogg – Fruit Manual p.251/1860]. ‘Although one of the oldest plums under cultivation, probably the oldest of the prune type, the German Prune is still as largely grown, the world over, as any; and is seemingly more widely disseminated than any other plum. […] In the Old World the number of strains of this plum, especially in Germany, is legion, so many that it is probably impossible to segregate them at this late date. […] The origin of this plum is uncertain. German writers very generally hold that it came from Asia whence it was carried during the Crusades to Europe. Lauche, a German authority, says, "In the Sixteenth Century, the first dried prunes were introduced into Italy, Switzerland and Germany from Hungary”.’ [Plums of New York p.220]. Listed in Addenda to the 1857 catalogue as ‘Fellemburg’ [Plum no.20/1857]. 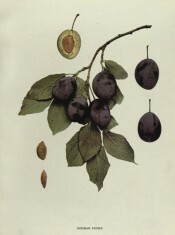 ‘Fellenberg’ is a synonym of the plum ‘Italian Prune’.